Start benefiting from The New Ergonomics Definition ™. It IS too late to master the old ergonomics definition and start using 'proper' ergonomics once you are in a lot of pain, or you drop your cup, drop your pencil, or drop your notepad because your fingers are numb and you have shooting pain and/or loss of strength. Those are just a few of the possible Symptoms of Carpal Tunnel and Tendonitis. First, I'll talk about the role of Proper Ergonomics in the workplace and/or in your hobby. Then I'll move on to The New Ergonomics Definition. I’m not going to speak here about sports or exercise related body mechanics. This conversation is about the use of your body in a Repetitive Motion Injury setting, as in working in front of a computer or doing something like knitting, cutting hair, or being a barista at a coffee shop. This conversation will be vastly more beneficial for you than a page full of ergonomics tips on how to better get in the right position to delay the onset of pain. 1. (used with a sing. verb) The applied science of equipment design, as for the workplace, intended to maximize productivity by reducing operator fatigue and discomfort. Also called biotechnology, human engineering, human factors engineering. 2. (used with a pl. verb) Design factors, as for the workplace, intended to maximize productivity by minimizing operator fatigue and discomfort. This definition is basically worthless to you, as far as staying pain free. Ergonomics is basically a 'scientific' study of the efficiency of people in the workplace. Efficiency is good. Less work for more results. In a Tendonitis context, this means more work with less missed days and Workman's Comp claims. 'How to work (or play) long hours, performing Repetitive Motions, while at the same time using proper body mechanics to minimize the development of Tendonitis and other Repetitive Motion Injury'. Proper Ergonomics, or ‘good ergonomic position’, truly does slow down the development of tendonitis related issues from Repetitive Motion Injuries (RSI), also called Repetitive Motion Injury (RMI). 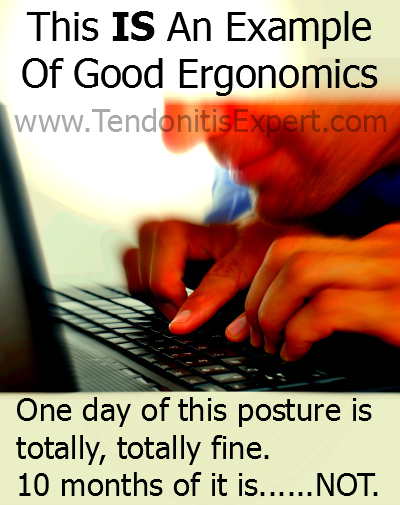 If you are using a mouse and keyboard all day, every day, every week, every month, every year, with ‘good posture’, it can take you much longer to develop the wear and tear injury of RSI. If you are hunched over, with your shoulders, arms, and wrists all at odd angles as you type type type and mouse away, you can develop pain and injury very quickly. If you work all day in an uncomfortable position, your body will literally begin to program itself and form itself into that position. So even when you then stand up and change position, every day you get a little more and a little more pulled into a posture that resembles that (uncomfortable) position. You know how if someone breaks their arm and is in a cast with their arm bent for 6 weeks, when the cast comes off their arm is ‘frozen’ in that position. People then have to work and stretch and force their arm to go straight again because the structure has adapted to that position. The way the body adapts to a long held position (like working at your computer) is by deciding to stay in that position. That same truth applies to sitting and knitting for hours. And standing and cutting hair for hours. And being a barista and pulling coffee all day. And working in a manufacturing assembly line. Your structure begins to shorten to the position you are in most often. If you do any of these activities regularly over time, it is vital that you be aware of, and at least to some degree use Proper Ergonomics and good body mechanics. You won't find pictures or explanations/descriptions of Proper Ergonomics on this website for two reasons. 1. This information, the world of the old ergonomics definition, is already on a multitude of websites and print sources. Long ago you probably learned 'good' positioning. 2. There is a Fatal Flaw to Ergonomic Theory, and I suggest that you avoid using good ergonomics altogether. Old Ergonomics is a very important and valid tool that you want to use to limit your exposure to the causes of Tendonitis and Repetitive Strain Injury. -AND- there is a FATAL FLAW of ERGONOMIC THEORY. This is where The New Ergonomics Definition comes in. Typing (or knitting, or checking groceries, or cutting hair) does not cause wrist pain or Repetitive Strain Injury. Typing with 'bad' posture does not cause wrist pain or Tendonitis. Typing in the EXACT same position, every day, every month, every year, causes wrist pain. There are two factors to consider, no matter how perfect your posture and positioning are. 1. If you repeat the same motion over and over and over again, your body is going to become unhappy. Repeating the same motions causes muscles to fire over and over. When a muscle fires, it contracts, and pulls on everything that is connected to it. Imagine a sponge being squeezed a hundred times. The sponge becomes dryer and breaks a little bit. The drier and crunchier it gets, the more it breaks/injures. That is what is happening to the muscles and connective tissue in your forearms and hands. Not only that, but Tendons slide through their Tendon Sheaths over and over, and both can get little tiny irritations and injuries that start a Process of Inflammation. According to the mechanics of the old ergonomics definition, if you ongoingly do the same motion for work or play, you will start to hurt. And that is ABSOLUTELY TRUE. Hooray for old ergonomics! Sooner or later, Muscle Tightness, Micro-trauma, and then Inflammation are going to conspire to create discomfort, and then pain. And then MORE pain. Hello Pain Causing Dynamic! 2. If you repeat the same motions over and over again, In The Same Position/Posture, regardless of the posture, your body is going to become even more unhappy. And the worse your ergonomics are, the faster you develop pain and injury repeating the same motions over and over again. The better your ergonomic positioning is, the slower you will develop pain and injury. Don't sit up straight, don't be perfectly aligned with the keyboard, don't have the computer monitor at just the right angle and your chair at the right height. Time for The New Ergonomics Definition ™! A way of safely performing ongoing, repetitive motion activities. Understanding how the body interacts with strain and making ongoing adaptations to avoid the creation of a Pain Causing Dynamic. Let's start with an office worker example. You spend 8 hours a day at your computer typing and mousing. Your wrists start to hurt and your employer sends in an ergonomics consultant that has an ergonomics certificate and she does an ergonomics evaluation of your office workspace ergonomics. Then she sets you up with an Ergonomic Keyboard and an Ergonomic Mouse and an Ergonomic Office Chair and an Ergonomic Office Desk and various other Ergonomic Accessories for your work space. That's a lot of ergonomics! You get back to work and your pain goes away! Hooray! Then you keep working like you used to, typing and mousing, happy and feeling safe from Carpal Tunnel Injury. A couple months later, you wake up with a 'full' feeling in your hand. Off you go to a full day at work. At some point after that, you notice your forearm and wrist hurt some. But it goes away. Then it comes back later. A little worse, and it stays a little longer. You are a little worried. Months later, you are a lot worried, with a lot more pain. And some numbness or tingling in your fingers. How can this be? You have a perfect ergonomic set up! That is a GREAT question! And a question that the medical community has only answered with "Old Ergonomics doesn't really work? Ok, well......wear a Wrist Splint or you should take Rest breaks or time off of work." And that just sidesteps the issue and slows the onset of pain and problem. 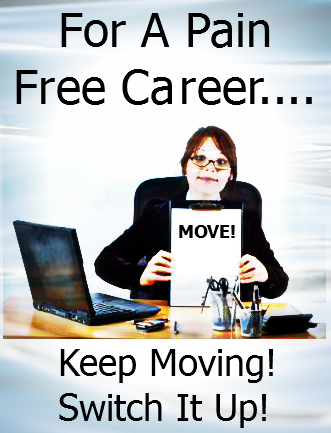 You can work all day every day -and- stay pain free. But you need to first understand The New Ergonomics Definition. You already know the old ergonomics definition, and it has worked for you as well as it can. It's time for an evolution in wrist health. Here is part of it. What if a career office worker saw this bit below? "A way of safely performing ongoing, repetitive motion activities. Understanding how the body interacts with strain and making ongoing adaptations to avoid the creation of a Pain Causing Dynamic." Imagine your work environment. Or you knitting/hair cutting/anything else environment. Imagine the 'right' way, the best posture, etc. Now. Do that for one day. The next day, move the chair up or down. The next day, change the angle of the monitor and scoot the chair farther from the desk. The next day, switch your mouse to your other hand. Maybe raise/lower the chair to a new and different height. The next day, put the monitor on a phone book or something to raise it higher. And scoot your chair to the right or left. The next day, switch it up again. **Time Requirement: About 10 seconds a day. 1. No matter what you do, if you do it in the -same- position or with the exact same routine of movements, a pain dynamic will form in your body. If you put your body in an environment where it continually has to do something new, like a new position every day, it will constantly adapt and 'move' in a new way. If it is continually moving in a new way, it can't shrink down and tighten up into a singular, habitual pattern. The concept to understand is 'Do your repetitive motion in a new way, a new position, every day. It can even be every couple of days. You need to try it out and see how it works for you. The old way is guaranteed to eventually start hurting. The new way is to constantly avoid getting stuck in a single movement. Again, Repetitive Motion doesn't necessarily cause injury. Repetitive Motion In The Same Position/Posture -does- cause injury and pain. Regardless of -your- situation, if you're at a desk or equivalent all day, you don't need to spend a lot of money. You just need to change your working position regularly to keep your body adapting. Return to the top of this New Ergonomics Definition page.